We finally made it to the Grand Canyon! After arriving in Phoenix Saturday morning and completing a packed itinerary, including the Devil's Bridge Trail in Sedona (here), Antelope Canyon (here) and Horseshoe Bend (here) in Page, we were thrilled to finally make it to the one sight you have to see when visiting Arizona! I was fully expecting the Grand Canyon to be all hype, but it really is grand. The drive from Page was about two and half hours. We left right after lunch and got to the first overlook by about 4:00pm. 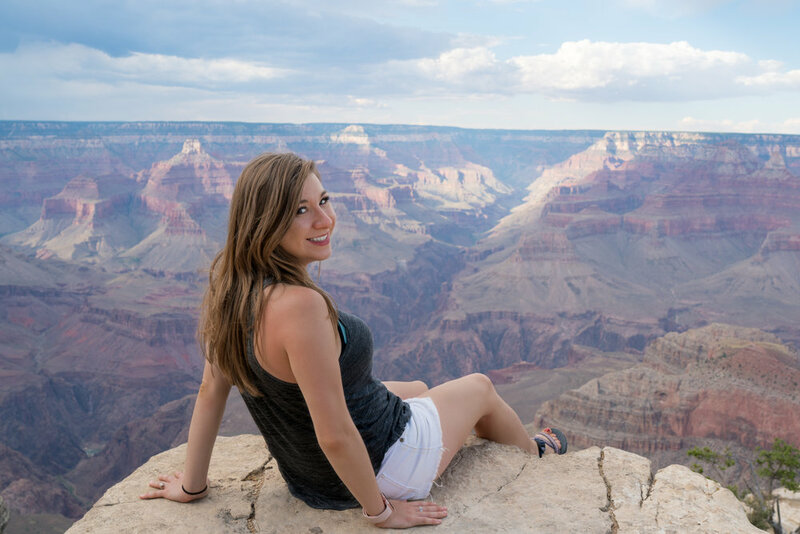 Right after you pay to enter Grand Canyon National Park, there is a visitors area on the right which offers restrooms, a gas station, and a towering overlook giving your first look into the park. 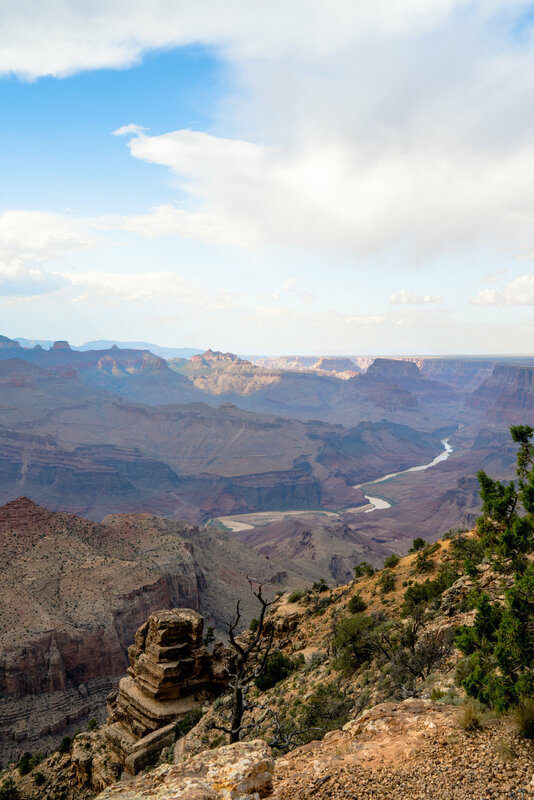 As you drive on towards Grand Canyon Village, there are several areas to pull over and capture a scenic overlook of the canyon. Finally, we arrived a Grand Canyon Village which is huge. The parking lot was full of tour buses and camper vans. There are more restrooms, concessions, as well as, an educational center to learn more about how the canyon was formed. As we reached the edge of the canyon, we joined the crowds of people looking for the best view of the canyon. There is a long walkway around the edge offering several viewpoints. The best viewpoints however are the ones that you can hike to. You edge down these would-be trail paths and hike to the cliff hoping for a chance to get as close to the edge as possible. Once again, I must emphasize that this is dangerous and one gust of wind could send you over the edge, so please exercise caution. You will see tons of people doing the same, though, and there are no fences or signs warning you against it. We stayed at the canyon until just before sunset. It was getting cloudy so we weren't sure if there would be much of a sunset to see. We also had a very long drive back to Phoenix ahead of us. The almost four hour drive is incredibly scenic. I was so surprised on this trip to see mountains and pine trees in addition to the expected red desert scenes. In fact, my sister was eager to see a cactus, and we didn't find a single one north of Phoenix. Thanks to my little sister for joining me for a spontaneous check off the bucket list! 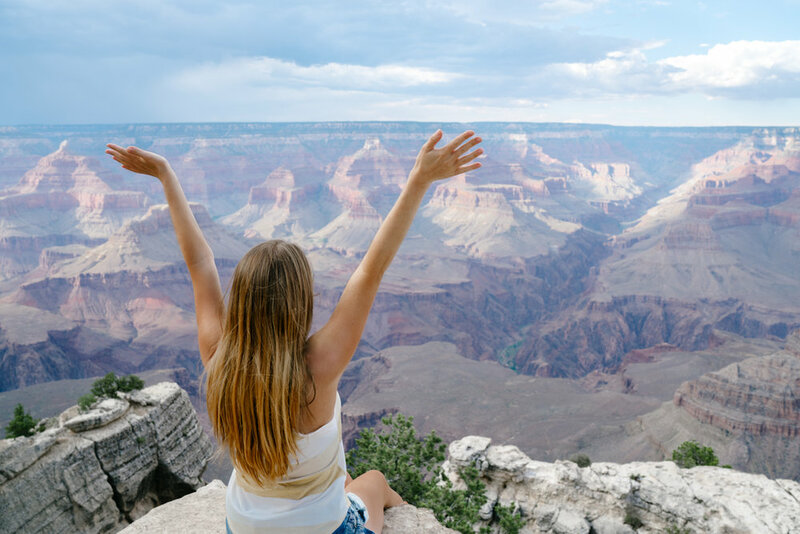 We proved that you can see the Grand Canyon and more of Arizona in less than 48 hours.